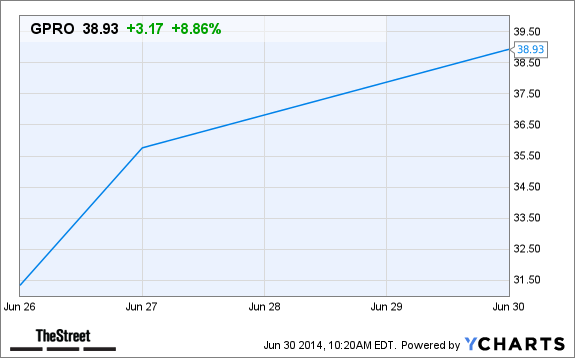 GoPro (GPRO) stock is continuing to surge following the company's IPO on June 26. NEW YORK (TheStreet) -- Shares of GoPro Inc. (GPRO - Get Report) are continuing to gain on Monday 8.75% to $38.89 following the company's successful IPO launch last Thursday. On its first day of trading GoPro shares jumped 30.6%, closing at $31.34, the Financial Post reports. GoPro makes wearable cameras used by extreme sports enthusiasts so they can record their feats and then post the videos online. GoPro is the U.S.'s first consumer electronics company to go public since Skullcandy Inc. (SKUL in 2011, Financial Post added.